U.N. Framework Convention on Climate Change (UNFCCC) executive secretary Christiana Figueres speaks at the conference in Tianjin, China, Monday. Beijing, China (CNN) -- Representatives from about 200 countries start meeting on Monday in China to narrow differences on climate change and grapple with extreme weather such as rising temperatures and melting polar icecaps. The weeklong talks in the northeastern city of Tianjin are the last official negotiations before the U.N. climate summit in Mexico at year's end. "It's vital that progress is made in Tianjin on two main areas -- new public money for developing countries and rich countries agreeing tough new emissions cuts under the Kyoto Protocol," said the international environmental organization, Friends of the Earth. Under the Kyoto agreement, developed countries have committed to cutting emissions by an average of 5 percent to 1990 levels by 2012. The 1997 Kyoto Protocol is due to expire in 2012. "Do they want more of the extreme weather events we have experienced this year to continue; to have their decisions result in warming of 3 degrees Celsius or more? Or do they want to set the rules that put us on track to a clean, renewable low-carbon society?" Temperature increases greater than 2 degrees Celsius (36 degrees Fahrenheit) would lead to climate disruption for the rest of the century and disproportionately affect poor nations, researchers have warned. "Rich countries should also provide public funding on a sufficient scale -- at least $200 billion annually -- to enable developing countries to adapt to the effects of climate change already wreaking havoc and to enable them to grow cleanly," Friends of the Earth said. 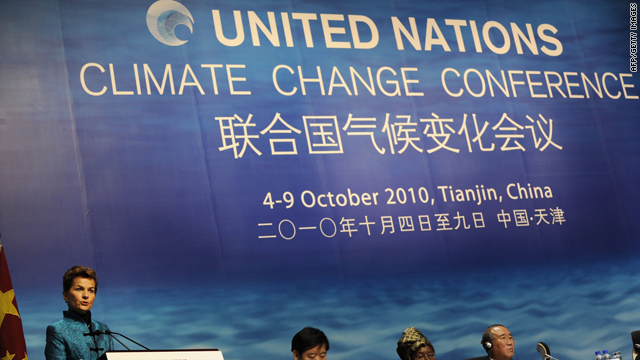 In December 2009, limited progress was made at key climate talks held in Copenhagen, Denmark. "Since Copenhagen, the world has seen the type of climate impacts that we can expect to see in the future, with droughts, fires in Russia and floods in Pakistan," Greenpeace said. "And as the climate talks open in Tianjin this week, seven states in Mexico are underwater from severe flooding. Last week, Los Angeles suffered the highest temperatures in recorded history." Climate change skeptics say that extreme weather and temperature fluctuations are part of normal weather patterns and are not caused by human activity. They also accuse climate-change activists of using bad science to pursue a liberal agenda. The U.N. climate summit in Mexico is scheduled for November 29 till December 10.